Abstract Now‘s EVRYTHNG EP takes us down the rabbit hole, squeezing us through a tear in the fence to emerge into the soundscape of a futuristic free party where sound systems echo from one end of the warehouse to the next. Analogue synths and drum machines forever reinvented release the inner city pressure as fragments of UKG, dark textures, muted optimism and experimentation collide under a backbone of Techno. It’s like catching up with an old friend; familiarity is contemporised. Drawing on a percussive background, at the age of 9 he was playing congas in his father’s Afro/Latin/Funk/Jazz band. Wrestling free into his own pursuits as a drummer throughout his teens and from there moving into the closed spaces of the studio and the warmth of analogue outboard gear, Abstract Now (also one half of production heavyweights HyperColour) is the present culmination of a darker exploration into sound. The EP opens in fine form with Default Drub: disco vocals riding a taut, springy bassline, smudged synths that rise and descend amid a roiling, growling cloud of bit-degeneration. Then everything gives way to a gargantuan fuzzy bassline that thumps you left and right like a sock full of sand. Abstract Now is typically light-footed and profuse with the breakbeat chops and percussion, slewing the rhythm around that mighty bass. The tone changes completely with EVRYTHNG. A tattoo of heavily gated kicks sets the rhythm and hems it in at the same time, underpinned by shuffled hihats. Rasps of distortion wrap themselves around the beat, scraped this way and that under the blade of a filter sweep; they rise in volume, like jets of exhaust escaping as the powerful engine warms up. Then the tune enters its groove, and there’s no arguing with it: an utterly compelling bassline in lockstep with those kicks, while two snares play off each other. Its components—industrial FX, lo-fi drums, and that bassline—are simple on paper, but the whole is so much more than the sum of its parts. The soul of the free party, and the dark hedonism of late-capitalist counter-cultural rave, live in this tune. Anthem. 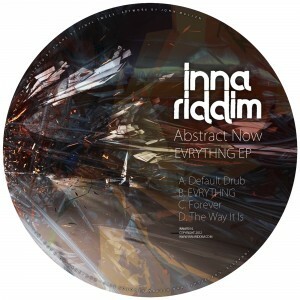 A combination of carnivalesque energy and monumental beats in Forever recalls the vibe of Abstract Now’s previous Inna Riddim outing as half of Hypercolour. A ravey chord progression, rising out of muffling filters to a sparkling clarity, ignites the track as a massive chunk of breakbeat and a seismic bassline erupt into the tune. The disco vocals can’t get a purchase as the ground breaks up; we hear fragmented snippets before they’re swallowed up and disappear among the twizzling funky keys. The Way It Is comes out of left-field to end the EP on a hallucinatory note. Eerie organ and sporadic percussion set the tone for a splash-reverb handclap and one of Abstract Now’s signature disco vocal samples. But then the tune spirals into its mesmeric centre, the first sounds disintegrating as a stereoscopic dot-painting of hundreds of sonic droplets swirl and descend around the listener. A scrap of rap vocals, chopped up juke-style, are pitch-bent and triggered against and around the beat, giving the final disorienting touch to this hall of mirrors.